Pre-Workout High Mood & Energy! Blunt Force Power! When you can’t wait until your next workout … you’ve been TURNT UP! EPG delivers a highly effective intense PreWorkout powder designed with 3,200mg Beta Alanine to increase endurance, and a Fast-Acting combination of 2500mg L Arginine and 500mg Agmatine Sulfate to accelerate the generation of nitric Oxide and flow into the muscles for skin splitting pumps. The Stimulant focus blend includes: 300mg Caffeine with theobromine, Dimethylaminoethanol Dicaffeine Malate, N-methyltyramine HCL with a peak of 3mg yohimbe HCL to create a moderate and effective energy-focus motivation to help most athletes achieve their goals. 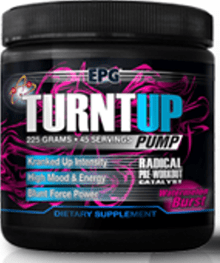 4 delicious flavors of a highly effective PWO at an incredibly low cost that includes a GET TURNTUP shaker free! SAY YES and GET TURNTUP today! The Thermogenic Fat Burning Pre-Workout That Makes You Feel So Good You`ll Want to Drink It Before you go Out at Night. Dimethylethanolamine, (abbreviated as DMAE Bitartrate) is an amino acid which is found in small amounts in the brain is a crucial substance that functions as a building block for choline, which allows the brain to manufacturer acetylcholine. Research indicates that acetylcholine, a neurotransmitter, plays an important role in the conduction and functioning of signals in the brain and the nervous system. Theophyline Anhydrous (natural), belongs to the same family as caffeine and theobromine. Much like its counterparts, theophylline is a non-selective adenosine receptor agonist that stimulates the A1, A2, and A3 receptors. Combining this with the other stims is sure to have your motor running and you may be ready to start bouncing off the walls! Rauwolfia vomitoria Root Extract (std. min. 90% Alpha Yohimbine) (5mgs per serving) will Raise the hairs on your arms and tingle the peak of your skull!! You Will Sweat while under the influence of Edge of Insanity!!! Beta Alanine (3,000 mg) will help users power through muscle fatigue, Beta-alanine is the building block of carnosine, a molecule that helps buffer acid in muscles, increasing physical performance. Beta-alanine can aid lean-mass gain. L- arginine/ Agmatine sulfate (3,000+ mgs) is primarily used as nitric oxide boosters. because they enhance blood flow to muscles, resulting in improved delivery of nutrients and removal of wastes during exercise, and increased muscle protein synthesis during and after your workout. These effects improve exercise performance and recovery and to increase the muscle pump feeling that can serve as a motivational boost during exercise. 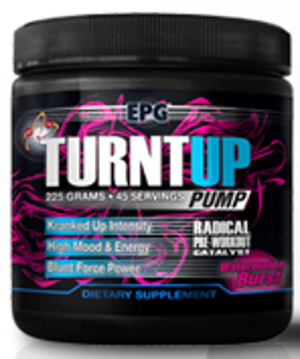 The “TURNTUP Blend” combined with the Endurance, Vascularity and Pumps Blend and other high-end ingredients make TURNTUP one of the most well-researched and “top-performing” pre-workouts available today. Cotton Candy This is a Buy 1 Get 1 FREE offer! Pina Colada This is a Buy 1 Get 1 FREE offer! Strawberry Mojito This is a Buy 1 Get 1 FREE offer!